Even though homesteaders tend to be really good at working hard, most of us need to get better at relaxing and pampering ourselves sometimes. That’s exactly what The Herb Lover’s Spa Book provides — information and recipes for naturally pampering ourselves. Author Sue Goetz has put together a beautiful and informative book filled with stunning photographs and simple recipes. After all, if you’ve been working hard, you don’t have time for anything complicated. The book starts out with a history of herbs and spas, then moves on to explain what you need to know to create your own garden sanctuary. 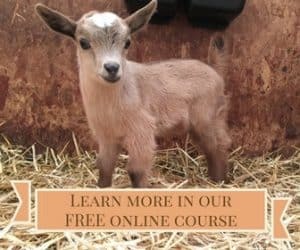 Because Sue is a professional garden designer, the info in this section is really helpful and inspiring. Then she talks about how to create a spa space in your home, knowing that most people don’t have enough room for a dedicated spa. A large part of the book is dedicated to growing herbs, with specific instructions and tips for growing 19 specific herbs. 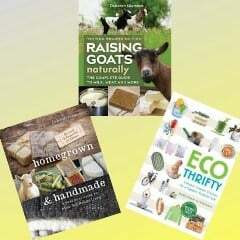 She gives you suggestions on sourcing plants, growing them, harvesting, drying, and freezing. Then she gets into the fun part — using them! Want a relaxing bath? Sue gives you instructions for making tea bags for the bath, so you can have a fragrant bath without the expense of essential oils or risking your health with synthetic fragrances. As much as I love essential oils, it bugs me that they’re too complicated to make at home. 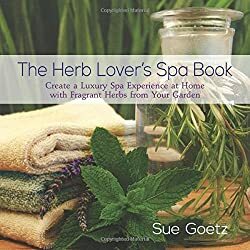 This book gives you the information you need to be able to use whole herbs to make your own personal spa products. For example, you can make a lavender heat pillow by sewing up a small towel and filling it with rice and lavender buds. Heat it in the microwave for about a minute and place it on whatever muscles are sore. (I usually wrap mine around my neck.) I’ve purchased similar products, and they usually cost about $20, so making your own would represent a huge savings, especially if you grow your own lavender. And whenever the lavender stops smelling fragrant, you can open up the pillow and replace it. But the book does more than simply give you recipes. It also gives you the information you need to create your own recipes. There’s an explanation about the different types of salt, and Sue explains why you should use sea salt and epsom salt (which is not really salt at all) for your body care products. The book contains dozens of recipes from a small sleep pillow that you can use on an airplane to a complete facial, including exfoliator, mask, toner, and moisturizer. There are also drinkable recipes, such as peach and rosemary spritzer and borage cucumber lemon water. Want to hear more? I met Sue Goetz at the Mother Earth News Fair in Oregon last month, and we chatted about herbs on Facebook Live. Watch the interview below. i wnt the book becauseit would be great to trty out recipes for my body that are beneficial. I use them for facials and in the bath to help me de-stress. I have used herbs in potpourri bags and in meal preparation.